The two competing trotskyist fractions within the Red Green Alliance had a lot more to risk. As they both are strongly involved in promoting movements as well as concerned about international cooperation, here one could expect interesting evaluations after COP15. The International Socialists in Denmark closely related to Socialist Workers party in Britain had a key position in the Red Green Alliance as central in the organizing of the Global day of Action demonstration. The key person Jörn Andersen normally representing the Climate Movement in Denmark tried to calm down the polarization between the promoters of the mass demonstration and Reclaim power contrary to some left wingers in the Swedish Climate Action organizations who saw their chance in stating that violence and actions against a UN summit is bad while broad mass manifestations as during the Iraq war is god. But the position of International Socialists seemed weak in the party. To get the party to mobilize was a hard job and to get a coherent position from the party on how to relate to the different mass activities even more so, if it ever was of interest or possible for this trostkyist fraction. The International socialists have a critical position in the party against the tendency of becoming more and more focused on parliamentary work. The contrast between state leaders and lobbyists official minus-performance summit and “civil society”, grassroots activities could hardly be greater. With 100,000 participants was the demonstration at the Climate Summit 12th December much larger than any of us dared hope. At a very successful KlimaForum09 thousands of participants discussed the problem of climate change. The requirement of “System Change – Not Climate Change” was embodied in a declaration already signed by approx. 500 organizations from 70 countries. Reclaim Power manifestation Peoples Assembly symbolized – despite police violence against both delegates and protesters – the community between North and South. The diversity of activities and solutions created during the summit a global movement that now will root even stronger in the many participants home countries. Here the different activities are not set up against each other, on the contrary they all get assessed on their own merits. But when addressing the future the only emphasis is on building a broader movement. As politically uniting he proposes campaigning for better public transport, stop for domestic flight or 100 000 new climate jobs. Social revolutionary demands are out of question. The problem for this internationalist troskyist fraction is that it lacks a lasting strategy other than opportunistic leftist engagement in campaigning with as broad coalitions as possible on issues that at the moment sounds pragmatically important. They should be honestly honoured for their great work in putting many years of work into building the broad alliances internationally on climate issues and trying to involve also the trade unions. But the lack of self criticism and lack of assessing the repression in Copenhagen make their position more weak than necessary. It is as if they want to say to the civil disobedience activists: Look now how repressed you were and how few, this shows that what we now need is a broad movement. 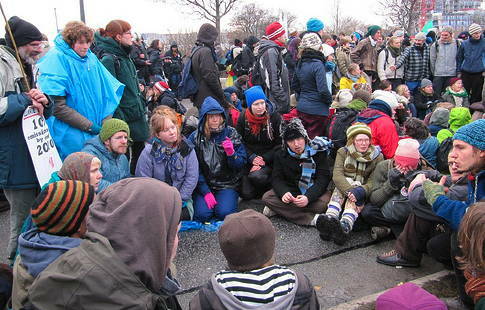 Two times have now Scandinavian political cultures been able to mobilize strong international events, the European Social Forum 2008 in Malmö and the mass activities at the Climate Summit in Copenhagen 2009. Alex Callinicos, influential in SWP Britain and internationally stated before ESF in Malmö that this would result in more reformistic and NGO dominated processes. The opposite became a fact. Both in Malmö and Copenhagen young civil disobedience activists took center stage and turned the dull ESF, Klimaforum and mass demonstration with a main message to appeal to leaders inside bella center into something much more interesting. In both cases NGOs were almost completely marginalized contrary to the predictions made by Callinicos, with the exception of the action were his own party had most responsibility, the mass demonstration in Copenhagen. When will we see a self critical assessment from this international troskyist tendency were they start to understand what went wrong in their interventions in the social forum process as well as the way broad alliances as the mass demonstration in Copenhagen are instrumentalized by branding NGOs, celebrities and political parties supporting repression of the demonstration without the immediate response from among others the International Socialists and their international comrades. 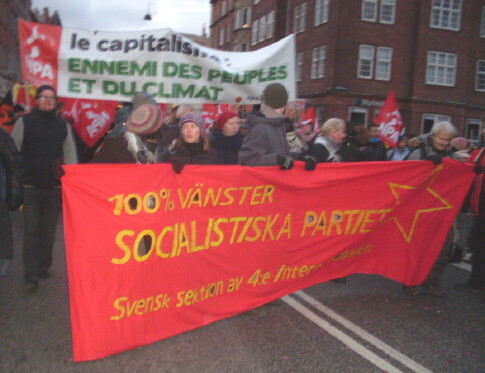 4th International parties from Sweden and France marching in the December 12 demonstration. Photo Röda Lidköping. The other trostkyist fraction have a somewhat stronger position in the Red Green Alliance, the 4th International. They also have a stronger position in processes as social forums were popular movements can meet. They also have strong experience in anti repression work, e.g. the Socialist party in Sweden who seems to be better informed or at least actively informed about the conditions for police action and repression in Denmark than the Red Green Alliance. The assessment by Thomas Eisler, member of the national board of Red Green Alliance and the 4th International is partly different from Jörn Andersen’s but at many telling points equal. Eisler makes a long story about the demonstration and mentions the other activities more randomly although Klimaforum gets a fair assessment. The Reclaim power action is not even mentioned. Only lumped together with other direct actions after the 12 December demonstrations and described as getting support from ”a less amount of actvists”. More importance is given to Greenpeace and Via Campesina having their accreditation taken away inside Bella Center and the speech by Chavez. But it is what was going on 12th December, which summarizes the true renewal of the movement for climate justice. While at least Andersen opened up for some kind of understanding of unity of the climate justice movement as not only a question of a gradual shift to a bit more radical least common denominator based broad demonstrations and coalitions Eisler does the opposite. Contrary to Andersen in his shorter article Eisler mentions the police violence against the demonstrators. But only against those in the demonstration the 12 of December and as a factual presentation excluding the role of the passive demonstration committee not to mention the support from his own party in the beginning of the police perspectives and the role given by his party to the demonstrators as sending signals to the leaders.